Across the education sector, we define what students need to know and should be able to do for succeeding in college and career. We know that they need more than just the ability read and write -- today's constantly changing workforce shows that they must be able to master academic content, communicate and collaborate effectively, think critically, and become life-long learners. These students are engaged in the six categories of Deeper Learning skills described below. 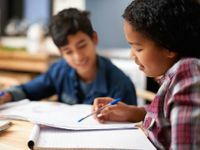 In addition to building foundational academic skills in reading, math, science, and social studies, teachers use many approaches to support students taking their learning and exploration to the next level. These approaches -- such as rooting projects in real-world problems or mapping facts and concepts to help build on prior knowledge -- enable students to connect ideas and apply knowledge across content areas. In the aforementioned robotics classroom, students engage deeply with math and physics as they measure and assess the impact of the changes they are making to control their robots' speed, agility, and water displacement. As students seek to tackle problems, they must be able to analyze those problems, develop solutions, and carry out plans to address them. Teachers integrate these skills into instruction through engaging activities that rely on competencies such as researching, brainstorming, and design thinking. The robotics students are testing their hypotheses and designing solutions to the unexpected challenges they confront in their robot design. Working collaboratively in school helps students become better team members in the future as they learn to identify strengths, assign responsibilities, and reflect on successes. By planning thoughtful group activities, creating expectations around group work, and encouraging conversations about open-mindedness, teachers support these skills. In each robotics group, students have created team agreements, identified group leaders, and divided responsibilities equally. Students develop their communication skills throughout their academic careers as writers, presenters, artists, and team members. Teachers strengthen those skills by providing students tools to communicate clearly, effectively, and persuasively across all grades and subjects. After the students have perfected their robots, they will present them to their classmates to explain the adjustments they made to the controllers. In addition to guiding students through instruction, teachers help them become self-directed learners who drive their own exploration. With support from their teachers, students set goals, track their progress, reflect on their strengths and areas for improvement, and can turn setbacks into opportunities for growth. In robotics class, students identify daily goals for their robot design in their groups, create challenges for their teams, and push their own learning to meet these goals. Beyond learning academic skills, students need to become life-long learners who take initiative, are persistent, and build relationships to access resources. Teachers support these mindsets through activities and discussions that focus on ethical behavior, resilience, and mindfulness. While not every experiment that the students try with their robots will be successful, they will not rest until they have found the best approach. Once the robots are complete, students will enter them in the Robot Olympics to determine the fastest, most agile, and most creative robots! Digital Promise recently released a report, "Developing a System of Micro-Credentials: Supporting Deeper Learning in the Classroom," that further explores the six categories above. The report also showcases 40 educator micro-credentials that Digital Promise designed to recognize educators who have developed competencies that support deeper learning. Micro-credentials recognize teachers for the skills and competencies they develop throughout their careers. Through the deeper learning micro-credentials, educators identify and demonstrate key competencies they can apply in their classrooms to ensure that their students enter college and the workforce ready to tackle complex challenges. Micro-credentials allow these educators to share these competencies with their peers, building a stronger professional learning community. As teachers seek to strengthen their instruction, it is vital that we support them in developing these competencies and provide meaningful recognition for those who do. What does deeper learning mean to you? How do you engage students with deeper learning experiences in your classroom and beyond? What competencies have supported your success? We'd love to hear what you think in the comments below.